Rancho Palos Verdes will soon create a Volunteer Trail Patrol program. CORBA PV has recommended the formation of a trail patrol for many years. It will be similar to volunteer patrols from other open space agencies including the Santa Monica Mountains based Mountain Bike Unit. The MBU was founded by CORBA in 1988 and now works under the National Park Service, the California State Parks, and the Santa Monica Mountains MRCA (Mountains Recreation & Conservation Authority). 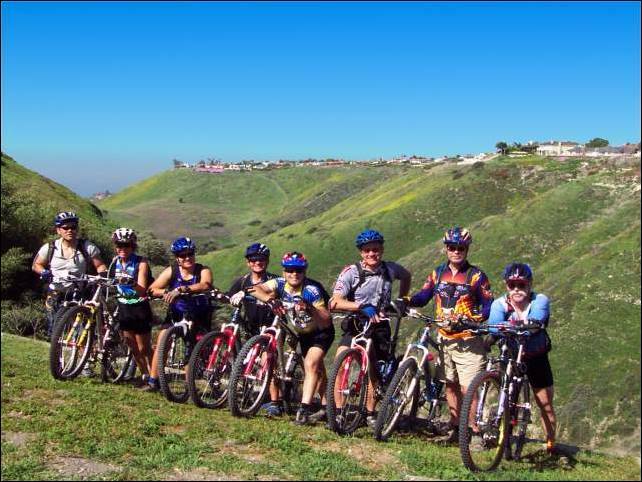 Volunteer Trail Patrol members will assist the MRCA rangers by regularly patrolling the Palos Verdes Nature Preserve on foot, by horse or by bicycle. The goal is to educate and assist trail users, report safety hazards, maintenance needs, and regulation infractions. Volunteer Trail Patrol members will not be able to issue citations or make arrests. It is important to have members from all three user groups on the patrol. Peer to peer communication is the most effective way to education trail users and minimize user conflicts concerns. For years CORBA PV has called on the city to collect factual on-trail information instead of relying on anecdotal comments at public meetings. Your participation will help collect accurate information and lead to impartial decisions by the city council. 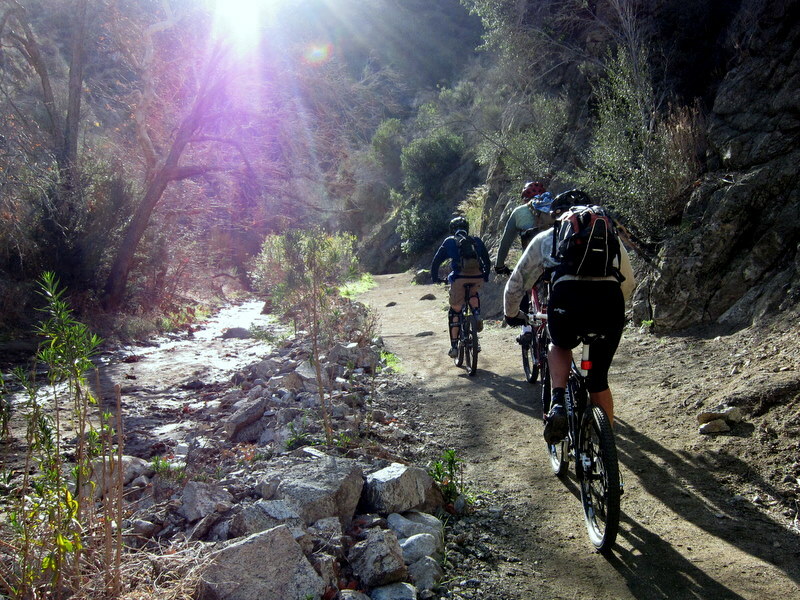 Thanks to the efforts of local mountain biking advocates from the Santa Clarita Valley, the County today announced that the Canyon trail will be opened to bicycles. The report identified trail improvements and modifications needed to ensure that bicycles can be added to the existing users safely, and these modifications will take place over the next five months. The County is seeking authorization to apply for habitat restoration grants to install bridges along the Canyon trail. The canyon trail is an easy trail, suitable for beginners, kids and family mountain bikers. It is also part of the longer and much-loved Los Pinetos loop. While the department is going to uphold the recommendation to open bikes, the decision could be challenged by other user groups. However, the State’s “Change in Use” trail assessment, which the County used to assess the trail, is designed from the ground up to be objective and defensible. Still, we need to thank the County and the people involved in the process, and keep an open dialog with them going forward. We extend our congratulations and sincerest thanks to The Santa Clarita Valley Trail Users group who were able to harness, contain and focus the community’s initial reaction to the trail being closed to bikes almost two years ago. Throughout the process they stuck to the “high road” as CORBA always recommends. Our collective patience and diligence through the process has paid off. The trail is expected to open in spring 2013. The Heritage trail in Vasquez Rocks is a different story. The County has identified many problems with innumerable “volunteer” trails in the area and a need for significant restoration, repair and trail improvements. The recommendation to keep the Heritage trail closed to bikes was upheld. In the future, when this park is re-assessed and new trails are considered, we will make sure to have a voice at the table. Following two community meetings and the review of all comments, the County of Los Angeles Department of Parks and Recreation announced today that it will uphold the Trail Assessment recommendations for the Placerita Canyon Trail and Vasquez Rocks Heritage Trail. The recommendation is to not allow mountain bikes on the Heritage Trail at Vasquez Rocks Natural Area in Agua Dulce and to allow mountain bikes on the CanyonTrail at Placerita Canyon Natural Area in Newhall. The recommendation to not allow mountain bikes on the Heritage Trail is based on the presence of significant cultural resources which could be negatively impacted by additional trail use; a lack of trails or connections to other trails outside the natural area where mountain biking is allowed; existing trail conditions which have been significantly compromised by many user created trails and the significant revegetation necessary to clarify the trail alignment. The recommendation to allow mountain bikes on the Canyon Trail is contingent on the addition of pinch points, signage, erosion control measures and other trail maintenance items. Trail maintenance for both trails will start within the next few weeks and following the completion of maintenance on the Canyon Trail, which is estimated to be completed in March 2013, mountain bikes will be allowed on the trail. The Department will address the safety concerns as identified in the Trail Assessment Report to ensure that the Placerita Canyon Trail is a safe trail for all users. The Trail Assessment process was completed by an independent consultant, The Planning Center|DC&E, who has extensive trail operations and sustainability experience. The consultant conducted two community meetings and solicited comments from the public as a part of the assessment process and made the Trail Assessment recommendations. The process used by the consultant and the Department is similar to one developed by California State Parks, but was modified to reflect the County’s Trails Manual guidelines and classifications. The purpose of the assessment process was to evaluate the condition of the trail and the trail’s sustainability as it pertains to existing and/or proposed use(s). 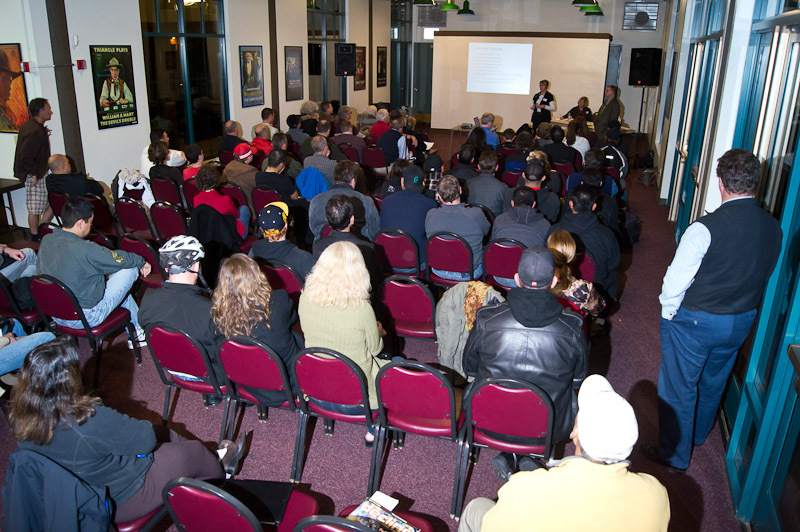 On February 15, 2012, more than 80 people gathered at Hart Park Hall in Santa Clarita Valley to hear and weigh in on the County’s plans. Of those 80 or more people, more than 70 identified themselves as mountain bikers. The SCV Trail Users did an outstanding outreach effort to get people to come to the meeting. Many brought helmets, identifying themselves as off-road cyclists. 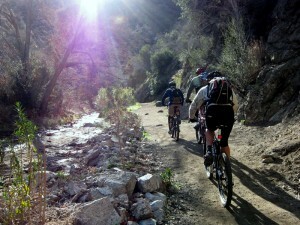 The closure of the Canyon trail in Placerita Nature Center to bicycles has united the cycling community in the area. The meeting was being conducted by DCE Planning, the contractor retained by the County to perform the trail assessment and make a recommendation. After a brief round of introductions by Melissa Erikson, Sarah Sutton gave background on DC&E’s experience related to trails and planning and the trails assessment process they will be using. Stephen Copely is the non-motorized trails manager for the fifth district, and will be the contact person for the County as the process moves forward, though he did not speak during the meeting. Melissa then gave some background of the DOJ ruling from March 2011 regarding accessibility and ADA compliance, which is her specialty. There’s a lot of misunderstanding about this DOJ ruling. Trail and open space managers must allow personal mobility devices–which in the broadest interpretation could mean anything from quads to motorcycles to segways to wheelchairs–on any trail that pedestrians/hikers are allowed, unless they can show a “good reason” they shouldn’t be allowed. In order to show a good reason, an objective assessment of the trail is needed. Essentially the assessment will kill two birds with one stone: determining the feasibility of personal mobility devices for the disabled and permitted uses on a trail. We are reaching out to all of you who signed the petition supporting equal access for all trail users, including cyclists, on the Canyon Trail at the Placerita Nature Center. Here’s an update. About 25 of us met with three park officials from LA County Parks and Rec on August 19 to express our outrage about the recent closing of the Canyon Trail to cyclists. At this meeting, the County officials explained that the previous signs allowing cycling on this trail were a “mistake” and also cited environmental and safety concerns relating to off-road cycling on this trail. However, the County officials admitted that this is a matter of policy and that policy can be changed. 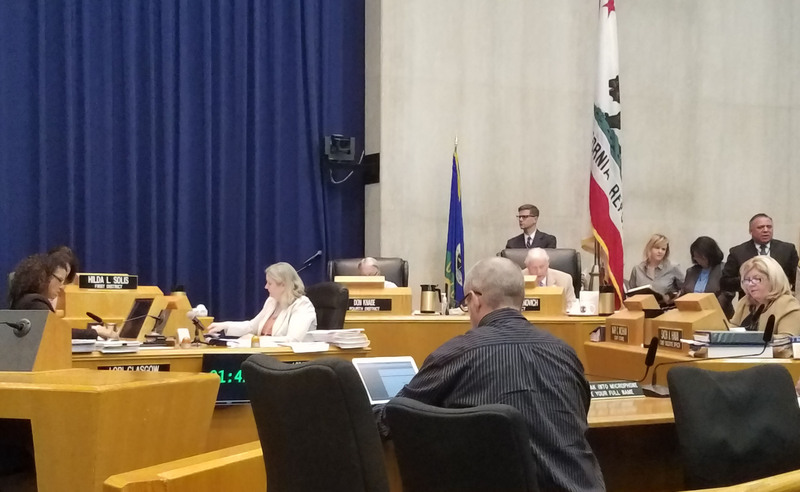 Kimel Conway, the senior official present at the meeting, agreed to schedule a meeting with Russ Guiney, the Director of LA County Parks and Rec, if we would prepare a “brief” summarizing our concerns and the possible solutions to their concerns. Since then, we have formed a committee to press on with our cause. Here’s what the committee has resolved thus far. 1. We have prepared a “brief” as requested by the County in preparation for our meeting with the Director. We are now working on scheduling that meeting at the earliest possible time. 2. We recognize that the issue is much bigger than the Canyon Trail at the Placerita Nature Center. Recently the trails at Vasquez Rocks were also closed by the County for much the same reasons. We need to advocate for safe and equal access to ALL SCV TRAILS. 3. We believe our best position is to advocate for safe and equal access for ALL USERS, not just cyclists. Even though others in our community want to exclude cyclists from the trials, we believe an inclusive position is most likely to succeed. 4. We have named our group the SCV Trail Users and will use the slogan, “Safe and Equal Access for All”. 5. We need to build a database of supporters as we will likely need to mobilize larger numbers at future public hearings. We will be using our Facebook Group, The SCV Trail Users – Safe & Equal Access To SCV Trails, our current petition, and this email list for this purpose. 6. We will be designing and distributing a flyer and a business card (to carry with you when out on the trails) with information about the Facebook Group, the petition, and our email list. We plan to make the flyers available at all of the local bike shops. Please help us build our database of supporters. We believe this will be critical to our success! Join our Facebook group, sign our petition, and add your name to our email list. Please ask other supporters to do the same. And be ready to show your support! Email SCVTrailUsers@gmail.com to add an email address to our list. The Canyon trail winds its way for 1.85 miles along Placerita Creek between Walker Ranch and the Placerita Canyon Nature Center. It makes a great loop with the Santa Clara Truck Trail and Los Pinetos. For many years cyclists have been riding this great loop, and it is a local favorite. 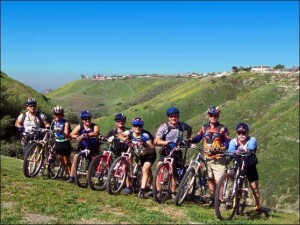 It is one of very few beginner- and kid-friendly trails in the Santa Clarita Valley. In July 2011 the trail was posted closed to bikes with no public notice, warning or input. Law enforcement have been on hand to ticket cyclists who ignore the signs, or didn’t notice them. The alternative return route after riding Los Pinetos is to ride pavement from Walker Ranch out to the Nature Center and back to the usual parking area. This paved, narrow two-lane road has no shoulder and no bike lanes, and is much more dangerous. There is no alternative easy out-and-back off-road ride for beginners or those looking for an easy ride. In County Nature Preserves like Placerita Canyon, it is at the sole discretion of the director whether trails are opened or closed to bikes. Local riders have been in contact with the park’s management about the closure, and are working to find solutions to mitigate the concerns that have led to the closure of the trail to bikes. While it is encouraging to know the County is open to hearing the concerns of local trail users who are directly affected by this closure, to have received no prior official or public notice of the closure has left the local cycling community frustrated and angered. The reasons for the closure were unclear, though environmental impacts to Placerita Creek were initially mentioned. However the trail remains open to equestrians who have much more impact than bicycles. Trail user conflicts seem to be the real reason, though to our knowledge no specific injuries or instances have been cited. CORBA has long argued that excluding a user group from a trail only leads to further division among user groups, whereas including all users helps bring the trail user community together to find solutions. As the local cycling community works with the County to find a reasonable compromise to re-open the trail, cyclists should avoid riding the Canyon Trail and obey all posted signs in the area. Read more of the local perspective from the RightOnSCV.com blog or coverage from The Signal. 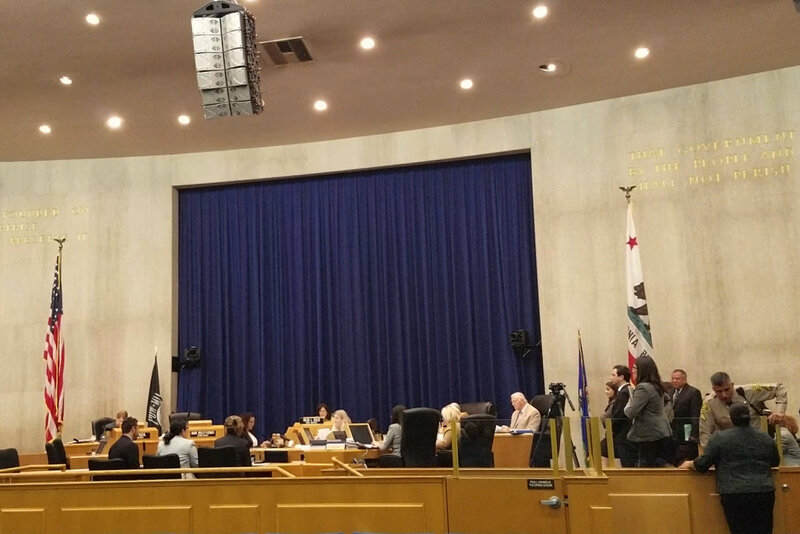 Last July, CORBA board members met with LA County Planning and Sapphos Environmental (the contractor developing the Trails Manual for the County), in a Mountain Biker only public forum. At that meeting only three CORBA board members attended, the County representatives, and nobody else. The Equestrian-only meeting had many more participants, as did the Hiker-only meeting. Since this document will not set any policy regarding trail designations, Sapphos deemed it more productive to hold separate meetings with each user group. Each group gave their input on what they’d like to see covered in the trails manual, and their special concerns. At that time in July 2010 there was only one section of the trails manual available for review: the section concerning trail design standards. Most of the standards in that preliminary section were adapted from IMBA’s Trail Solutions book, and other reputable multi-use trail construction texts. It was to be a technical document on building and designing trails, with no influence on the contentious issues around trail user groups and trail designations. The County’s stated policy and goal is to accommodate all user groups on all trails possible. It is a multi-use, bike-friendly policy that works. We were informed at that time that there would be another round of public hearings as the manual was developed, based on the input from user groups at these meetings. 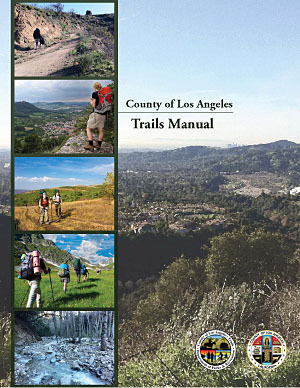 The Manual is being developed with a grant from Supervisor Antonovich’s 5th district, in which the vast majority of the County’s trails can be found. The County has never had any offical trail standards, and many of the older trails are not really sustainable by today’s standards. However, this document would NOT be applied retroactively to existing trails, but will serve as the reference for all new trails that come before the County. It is likely that many of the 88 cities in Los Angeles County will also adopt this manual for their own standards once it is ratified by the County Board of Supervisors. Fast forward to the February 28, 2011 public hearing. Steve Messer, and CORBA member/local cycling promotor and activist Dorothy Wong attended the meeting, along with about 40 local equestrians and hikers. For a welcome change from other meetings in which CORBA has been involved, the biggest issues raised were not contentious user conflicts, but rather, design standards pertaining to potentially flawed trail designs and citations from outdated Equestrian studies and facility designs. The city of Santa Clarita recently closed escrow on the 842 parcel of land known as Elsmere Canyon. Elsmere was slated to become the largest landfill in Los Angeles during the 1990’s, before Senator Barbara Boxer and Congressman Howard McKeon fought to prevent the devastating landfill project.